Home » News » I'm Lichen It! 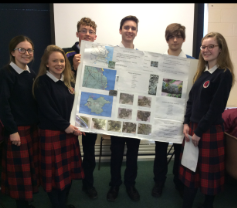 Ardgillan Community College and Skerries Community College have been working on a joint project to raise awareness about lichen. The project was originally solely a science project and was entered in BT young scientist by the Skerries students. We met when we discovered that we had a common interest in entering Eco-Unesco, we worked on making the project more awareness based as we discovered lichen are a great way of looking at pollution in the local area. We wanted to bring awareness to this aspect of nature. The schools got in contact with each other and have been working together ever since. We raised awareness by going to local primary schools such as St. Teresa’s Primary School, Scoil Chormaic Community National School, Milverton National School, St. Patrick’s National School and Holm Patrick. There we gave them a PowerPoint presentation, worksheets and showed them many different samples of lichen we found. We discovered that green/white lichen indicate little pollution in an area and yellow/orange lichen indicate a town is heavily polluted. We collected samples of bad lichen from places such as Balbriggan and Malahide, two towns that are polluted because of their very active harbours. We also collected samples of good lichen from places such as Skerries, Ardgillan Park and Lambay Island which is a remote island off the coast of North County Dublin. We even discovered a new species of lichen that was previously unknown to Lambay named Hyperphyscia adgulinata. We learned this information by visiting Howard Fox, a lichenologist in the Botanic Gardens. We brought awareness to young people through the use of social media such as a blog, snapchat, Instagram and twitter. These various platforms allowed us to reach out to as many people as possible. As of right now we have reached out to and educated over a thousand people about lichen and how they can indicate pollution in the environment. After some of our work was complete we went to Eco-Unesco to present our project so far. Eco-Unesco is Ireland’s environmental education and youth organisation. They work to conserve the environment and empower young people. We entered into the Eco-Unesco Young Environmentalist Competition in the hopes of winning the Young Environmentalist Award. Recently we found out that we’ve actually gotten through to the finals of The Young Environmentalist, which will be held on the 23rd of May 2017. Now that we have gotten through we have much more awareness work to do. We plan to do more awareness work at primary schools, make new and improved posters and leaflets, create a fully functional app and website and continue to update our various social media platforms so our followers can stay informed as we continue our project.